The Bon Secours Hospital Cork has announced it is the first hospital in Ireland to offer pioneering robotic-arm assisted joint replacement surgery. Ireland’s largest private hospital has invested in in new robotic arm assisted total knee, partial knee and total hip replacement technology. 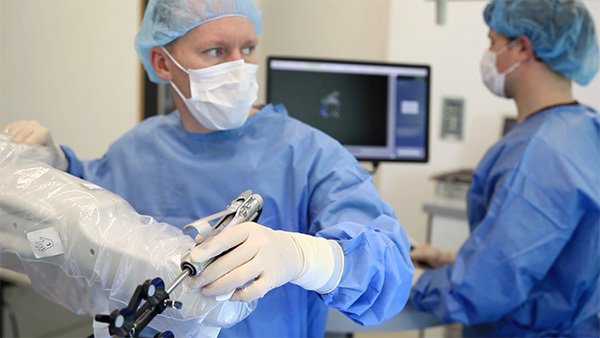 During surgery, the surgeon guides the Stryker Mako robotic-arm during bone preparation to prepare the hip or knee and then positions the implant according to a pre-determined surgical plan. The tool aids precision surgery, helping reduce post-operative pain and speed patient recovery time. Mr. Stephen Brennan, Consultant Orthopaedic Surgeon at the hospital, said: “Bon Secours Hospital Cork has been pioneering health care in Ireland for over 100 years since its inception. “This latest investment in leading-edge robotic-arm assisted surgery, the first of its kind anywhere in Ireland, represents another exciting chapter in that story, and positions Bon Secours Hospital Cork at the forefront of advanced medicine and exceptional care. “With this technology we can provide each patient with a personalised surgical experience based on their specific diagnosis and anatomy. It’s exciting to be able to offer this transformative technology offering state-of-the-art care to patients at every step of their journey through the process from planning to post-operative recuperation and care.